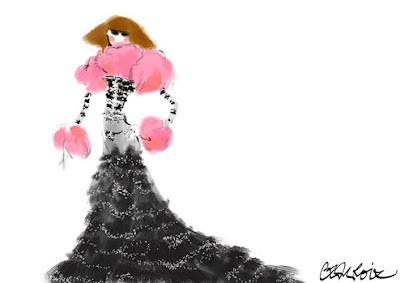 It's a sad day for Haute Couture. 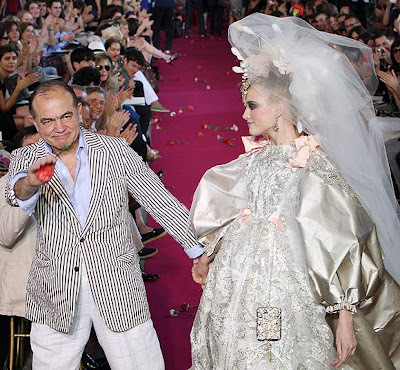 One of the most ingenious designers of our time, fashion legend Christian Lacroix, has filed for bankruptcy in Paris, (an equivalent to chapter 11 here in the States). A court will now have to decide whether or not the fashion house will be restructured or liquidated. Mr. Lacroix's couture business has been trampled by the economic downturn, and simply could not survive its relentless barking creditors. This past January during Lacroix's Spring 2009 couture show, the collection (above) did not stray away from applying opulence to his rendition of a global economy under attack. His designs continued to bask in their usual imperial splendor. Each piece that walked down his runway was adorned with either ruffles, lace, bows, chiffon implementations or all of the above. While some fashion designers felt a need to respond directly to the economic crisis, Lacroix in turn told Style, "I cannot pretend to be somebody else." And this reaction did not go unnoticed. Nell Campbell, one of Lacroix's patriots told Style after seeing the show, "Darling, does Christian Lacroix know what happened at the stock market a couple of days ago?" It is unfortunate, that to the fashion house's demise, the long term strategy concocted by Nicolas Topiol, the company's chief executive since LVMH sold the house to the Falic Group, had decided to sidesweep the ready to wear collections and centralize the entire business on the haute couture line. A plan that too many, including Lacroix's fans, thought was a highly irrational move to push forth if the goal was to adapt to a dwindling economy. The visionary designer also saw the demand for change as perhaps having to compromise his fashion philosophy. For Lacroix, keeping his muse as regal as possible, which also means retaining an avant-gardian aesthetic to each look is the only point to creating a collection. True to his form, the video showcased (below) is an excellent exposition of his artistic vision, undisturbed by our current financial times. To you Mr. Lacroix, may you find your way through the downpour of this economic storm.